One of the reasons I've been silent here for a bit is that it was my husband's birthday on Monday so I was working on a little present for him (Just some fleece PJs which he is wearing right now). Just couldn't blog about it until I gave them to him! He is also the proud and obsessive owner of an ipod touch and I'm the jealous, covetous wife that gave it to him! Man, that thing is cool! I also got one of my "Don't you even think about Christmas until your to do list is finished" items checked off. 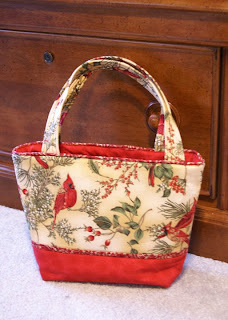 My mom has a friend who likes cardinals, but my mom could only find cardinal Christmas fabric, so she had me make her a Christmas Oiseaux bag. I didn't really anticipate the bird theme taking over this bag, but I guess sometimes projects take on a life of their own! In other random news, I saw the oddest craft product in the Joanns catalog that came to my house the other day. It's a rotary cutter with speakers. And an ipod dock. Really. I use my paper trimmer a lot, but I have never looked at it and said, "Golly, I wish you had speakers!" Maybe this will be useful to someone?? Maybe I will get it for my husband for Christmas for his new ipod ;) It's very cute though! Up next is the coffee pot rotary cutter for those late night crops! I love the Cardinal bag. It is really nice! OMG - if you could find me a coffee pot rotary cutter I'd buy it. I feel as if I have coffee coursing through my veins these days. Cute bag! I love birds :) As for the rotary cutter...hmmmm, how much does that cost? It is a bit strange..
haha, that paper cutter is genius! Oh my! I've never thought my trimmer needed speakers either - very odd. You've been given a BLOG reward, please visit my blog to pick it up! What a lovely tote, Keri! Love the fabric. 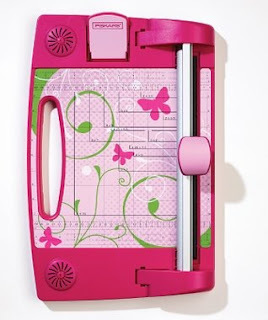 Now as to that cutter, not sure that it would be on my list of must haves...but being pink it is cute! 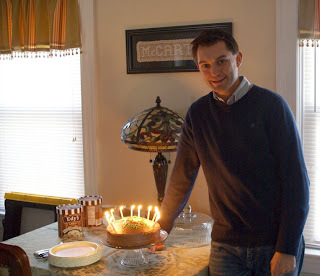 Happy Bday to your Hubby. Lucky him new PJ's and an IPOD TOUCH!! What a great bag you made. thanks for the tip i will have to check target when im home! I love that bag, it's holiday and yet seasonal so you can carry it all winter long. Plus it's a nice punch of color.